Thinking they are cowards is a mistake my friend. i agree, people who are willing to take their own lives are semantically much different than cowards..
How does one faction provide an ideology that transcends self destruction? Islam doesn't have a central figure for the masses to follow--the closest would be the Shiite leader of Iran, ( there is no Pope...) Islam is fragmented into thousands of enclaves dominated by local imams. Until there is some wave of enlightenment by the secular muslims throughout the planet, i don't see the culture by the extremists changing. Where, exactly, would the mushroom cloud rise? Iran, Saudi Arabia, Indonesia, Pakistan, Detroit? It is certainly too bad that we can't plug in a few coordinates and send these scumbags to their 72 virgins. I always thought they shoulda launched a nuke missle into Afghanistan the week after 9/11. 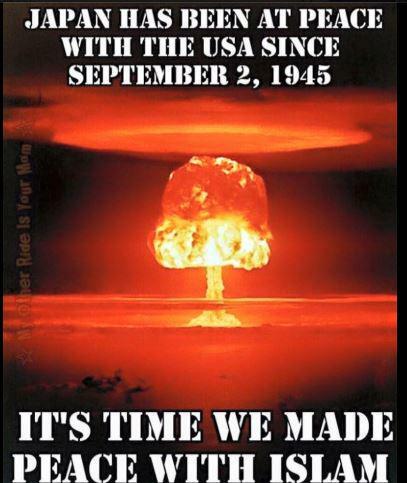 Just to send the message "oh btw, I guess you forgot that we got these"
Where, exactly, would the mushroom cloud rise? Iran, Saudi Arabia, Indonesia, Pakistan, Detroit? Where, exactly, would the mushroom cloud rise? Iran, Saudi Arabia, Indonesia, Pakistan, It is certainly too bad that we can't plug in a few coordinates and send these scumbags to their 72 virgins. They are all complicit to one degree or another..
Europe took the passive approach to the radical islamic threat instead of joining a joint task force to eradicate isis by committing ground troops. Europe then doubled down by allowing the refugee invasion flood their countries. Taking the refugee invasion into the US is not the answer. Nuking islam is not the answer. Europe sending in ground troops along side Saudi Arabian ground troops is a good start. The US will provide air cover. Ill take it a step further. Skinny jeans Syrian males must be drafted into a joint task force equipped as ground troops . We are at war with Muslim extremists. There are extremists in all societies and each must be dealt with but let's focus on the obvious threat to every nation in the world. There is no way to tell a Muslim from an extremist. Some claim that not all Muslims are extremists but it is obvious that where there are Muslims there are extremists. Muslims are spreading into all corners of the world and the do not intigrate well with societies that are different than themselves including other Muslim sects. These extremists do not have a city or country that we can attack and destroy. There is no way to fight an attacker that has no border or organized government. Isolationism is one solution although not practical. Full scale profiling cannot and will not happen. We have to call the enemy what they are - extremists. Peaceful Muslims must speak out and separate themselves from this evil or risk being no different. This is harsh but so are the Muslim extremist ideals. There is no room for political correctness or fear of reprisal, that is part of what got us where we are today. Think of them as fire ants. They cause pain and destruction wherever they go. They must be destroyed as soon as they appear. Europe is the middle of WW3 and they don't know it, or wont admit it. 90 percent of the Refugees appear to MAM's Military Age Males. They don't come in peace, they come with purpose to breed and populate Eurpoe with more Muslims. Terrorism is only one tool the modern Ottoman Empire/Caliphate/ISIS (Whatever you want to call them) is using against the West. The real threat is their mass migration and cultural degradation of western values. We are at war with Muslim extremists. Given our current administration, we are not at war with them, they are however at war with us. I have heard it stated and truly believe that a true brave man is one who is scared but goes forward into danger anyway. These Muslim terrorists are not brave and are indeed cowards. They are crazy maniacs that believe that killing all those who disagree with their stone age religion should be killed and that by doing so they will enter paradise. They do hide behind women and children in order to accomplish their maniacal goals. They kill innocent non-combatants for the purpose instilling fear into good people. They might be willing to blow themselves up and die for their "cause", but that doesn't make them any less of a coward. There is a difference between a coward and a zealot. That video makes me sick! Yes, the video is sensationalized, but it is the truth. Wake the hell up people. World War is here, we just aren't actually in it YET. They are coming as we speak. It's amazing to see the blind eye a majority of Europeans have for what is happening in their own countries. It's even more disturbing that Americans refuse to acknowledge it and area actually willing to accept these mass "refugees" into our country. Their goal is to breed out non Muslims and essentially take over the weak, no backbone, liberal Western countries. These people are not dumb. Whats a shame is how deep rooted the hatred is. These kids are born straight into the idea that Western Ideology is not tolerable. Hard enough to change some crazy kid that falls into the neo-nazi ideology in his teens, almost impossible to change someone born into a crazy ideology. What I dont understand is how the religion can be interpreted so many ways. There ARE peaceful muslims believe it or not.... they are among us in the US right now. Are they going to just snap and become agaisnt western ideology? No. The ones born into it are. And there is no "background" check that is going to confirm that deep rooted hatred. So the guys that entered the French dance hall and opened fire with shotguns on unarmed young men and women should be considered brave warriors?